Intermediate Physics for Medicine and Biology: Do I Make Myself Clear? Of course, I became curious how Intermediate Physics for Medicine and Biology fared with these redundancies. So I hunted for them using the search box in my pdf version of IPMB. Most were absent, but a few appeared. I’m not sure they are always bad; you can decide for yourself. I enjoy doing this sort of thing, but is it fair to subject my dear readers to this analysis? I believe that writing well is critical for scientists; if pointing out some sloppy writing in IPMB can help others tighten their prose, the effort is worthwhile. Evans puts the whole phrase in italics, which must mean he thinks it is unnecessary. Our text would probably be better by deleting “a distance of” from the homework problem on page 497: “Use the appropriate values for striated muscle to estimate the dose to the gonads if they are at a distance of 50 cm from the x-ray tube." I suspect that Evans is irritated by authors who write “a period of time,” which Russ and I never do. Sometimes we use “a period of” in the mathematical sense of the repeat time of a periodic function, such as on page 342: “If you are told that there is a signal in these data with a period of 4 s, you can group them together and average them.” No change is needed there. On the other hand, this text from page 39 is a borderline case: “figure 2.10 shows the survival of patients with congestive heart failure for a period of 9 years.” To me our prose sounds fine; I’m not sure what Evans would say. I admit, we occasionally have the unneeded “to be” after “appear,” such as on page 178 “does the charge distribution appear to be continuous or discrete?” and page 297 “do the results appear to be chaotic?” I write mainly be ear, and my ear isn’t bothered by “appear to be.” I am left wondering: “to be,” or not “to be,” that is the question. We have a lot of “completely”s in IPMB, most of which I am comfortable with. One questionable case appears on page 125: “if a solute is present to which the membrane is completely impermeable...” At first the completely sounds unneeded—a membrane is either permeable or it is not—but we had just introduced the hydraulic permeability, a parameter that can be very small without being zero. Saying “completely impermeable” is probably fine when we mean the limit as the hydraulic permeability goes to zero. I side with Evans that completely is unnecessary on page 88 “this differential form of the continuity equation is completely equivalent to the integral form,” and on page 279 “Jules Henri Poincaré realized around 1900 that systems described exactly by the completely deterministic equations of Newton’s laws could exhibit wild behavior. Do I Make Myself Clear? 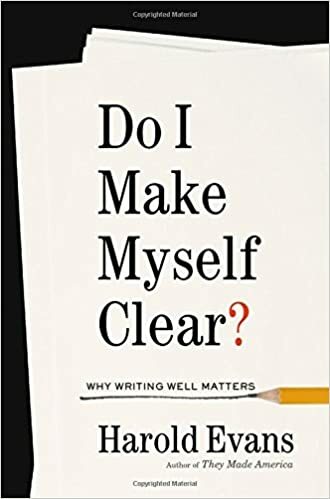 is a fine book, although in my opinion it is not as good as Zinsser’s On Writing Well. Scientists are judged by their journal papers and grant proposals, both written documents. You need to write well, or your reputation will suffer. Eliminating minor redundancies is one way to make your writing clearer and more concise. Train your ear to listen for them.